Don't have a Design Page? On your Design Page you work directly with our Artists. 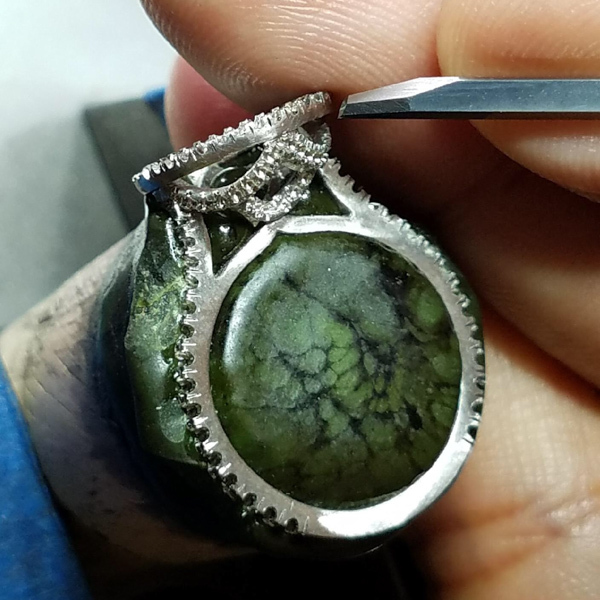 Save your favorite design, share your ideas, work together to design your own ring or other custom jewelry, get prices, inspiration and innovative ideas. Sign up for a free, no obligation! 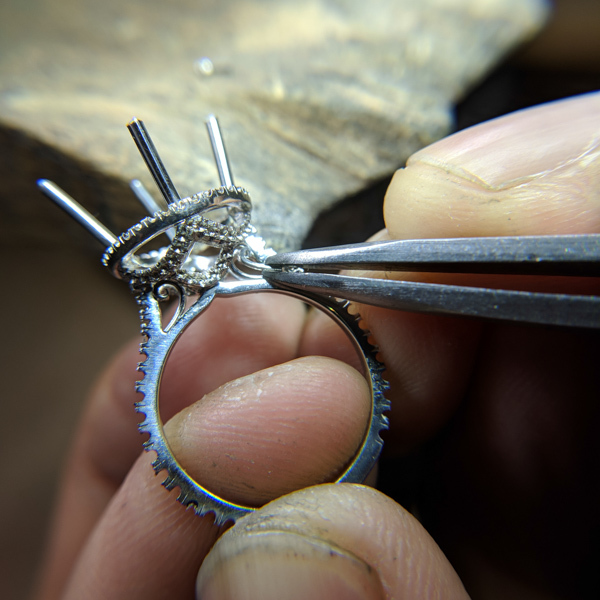 Have you ever wondered how a ring is made? At Green Lake, we love to share every step of the process with our clients so they can see first-hand the care and attention that goes into creating each unique design. 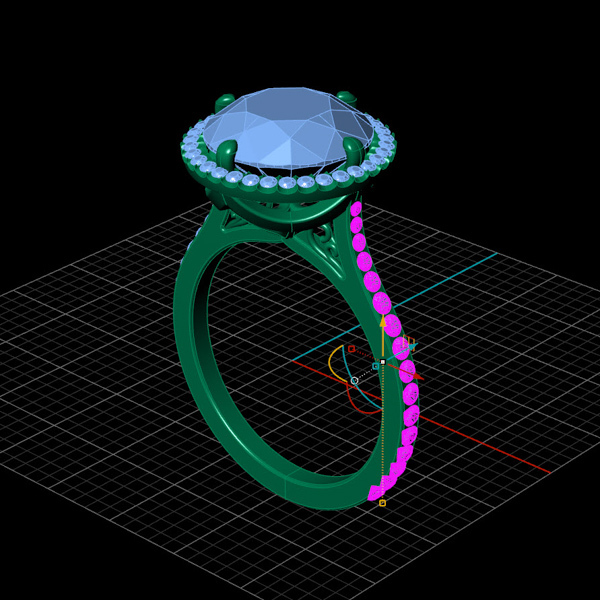 From start to finish, we proudly present this custom ring design to you. 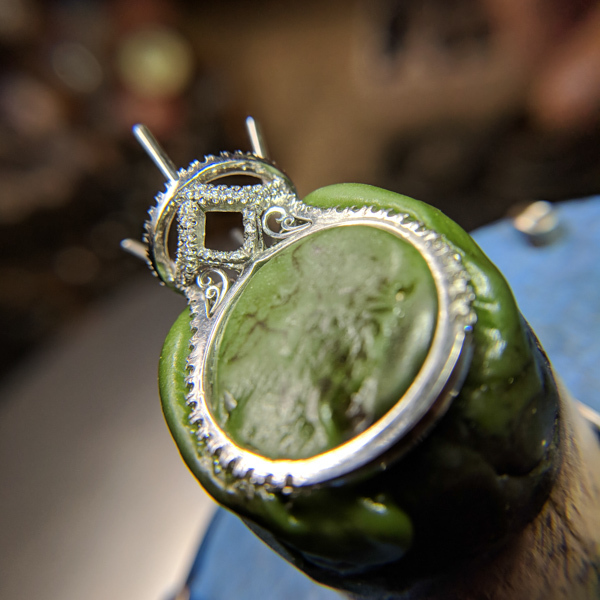 The start of this custom ring design begins at our Bellevue Studio. 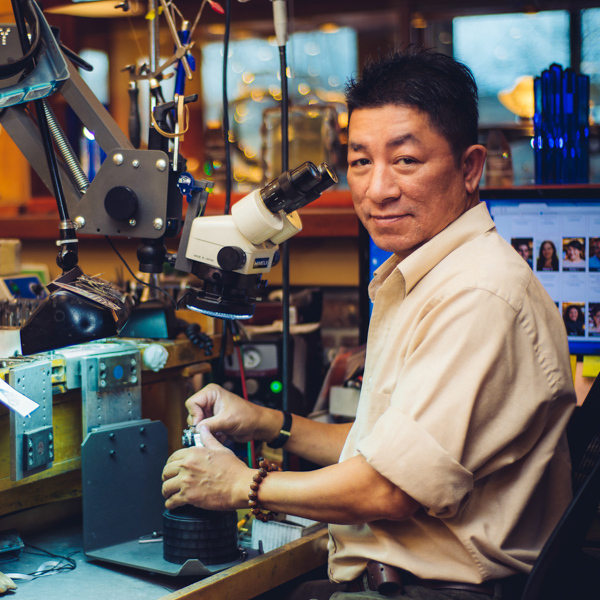 Green Lake Jewelry works originally opened its doors on Seattle’s Green Lake Drive in 1996. 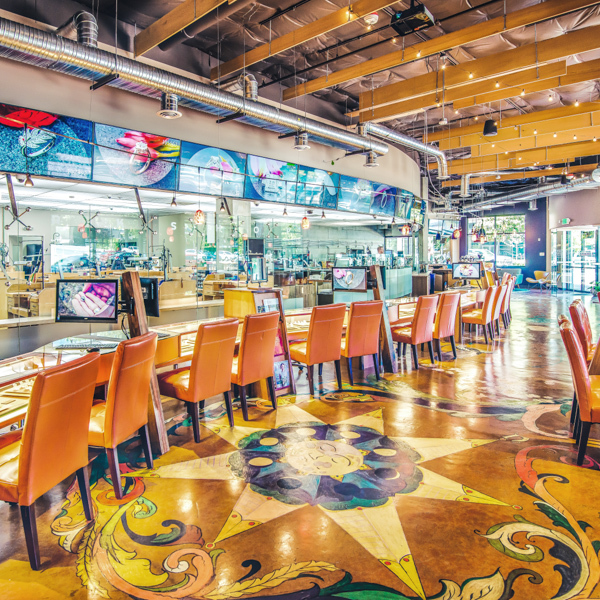 In 2016, a second studio with its own jeweler’s workshop opened in Bellevue. We made this beautiful custom ring right here on Main Street! 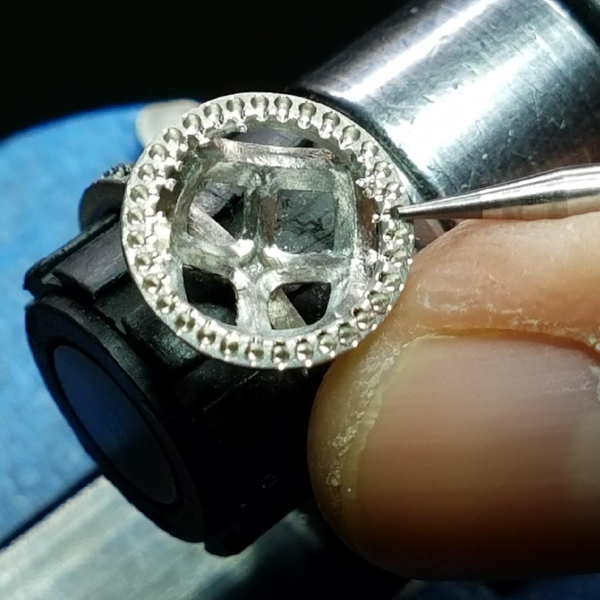 The center of this custom design is a 3.81 carat diamond sourced by Green Lake Jewelry Works exclusively from the Antwerp Diamond Quarter [Diamantkwartier], an area of Belgium historically recognized since the 15th century as an epicenter of the diamond trade. 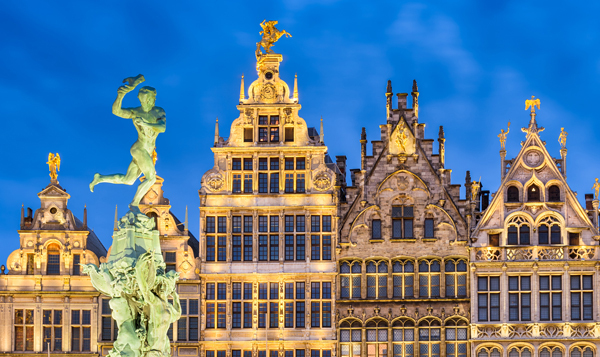 Today, it is the largest diamond district in the world, and home to 380 diamond faceting workshops. 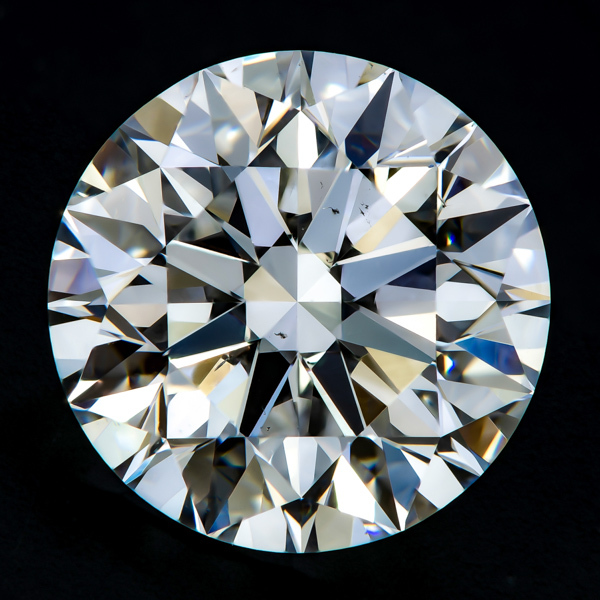 The diamond itself was faceted for incredible brilliance. 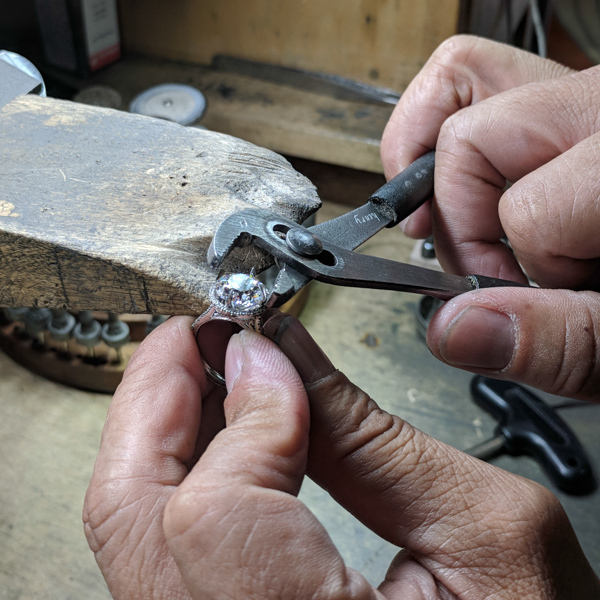 Once a rough diamond has been mapped by a gemologist for its most ideal cut, a lapidary begins to cut away material and carefully polish the diamond. The polishing process can take weeks due to the innate hardness of the material. The design of your engagement ring was crafted exactly to the proportions of this diamond and to highlight its truly gorgeous ideal cut. Each ring at Green Lake begins as a sketch. 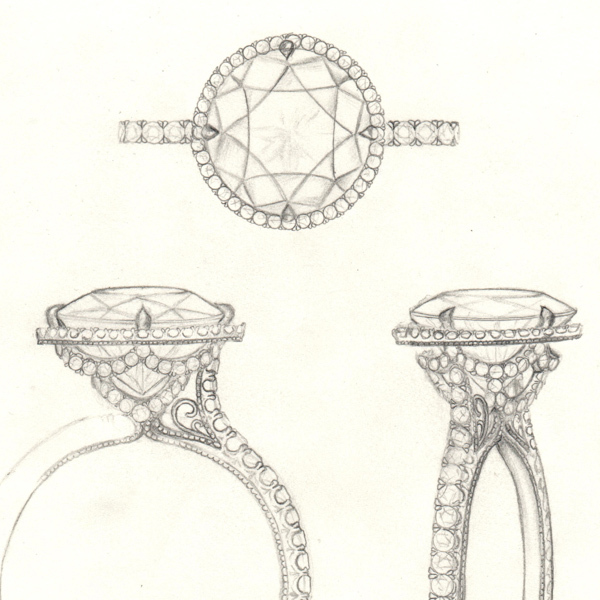 This sketch was created to highlight the incredible diamond center with delicate handcrafted details such as filigree in the undergallery, fine milgrain around the edges of the design, careful wheat engraving, and crisp fishtail-set meleé diamond accents. The stunning scalloped architecture supporting the center diamond beneath the halo will be a truly remarkable element to the final ring. 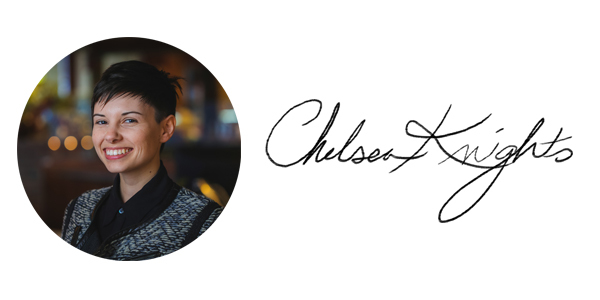 From initial sketches to a fully developed design, Green Lake designer Chelsea made sure every detail was scaled to fit perfectly with the proportion of the diamond and intended for a lifetime of wear. Next, the sketched design is translated to a three-dimensional computer model. 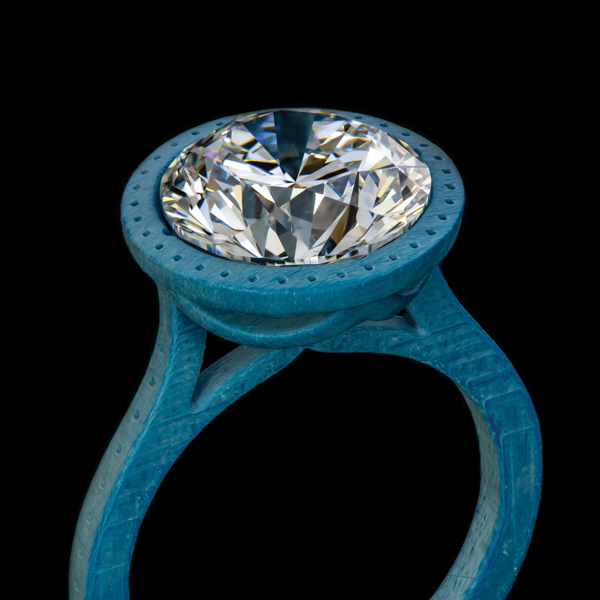 This virtual ring was first created with specific X,Y, and Z coordinates to guide a 3D printer to create a resin model. Once the CAD model has been printed, it is confirmed for fit and look by the client. 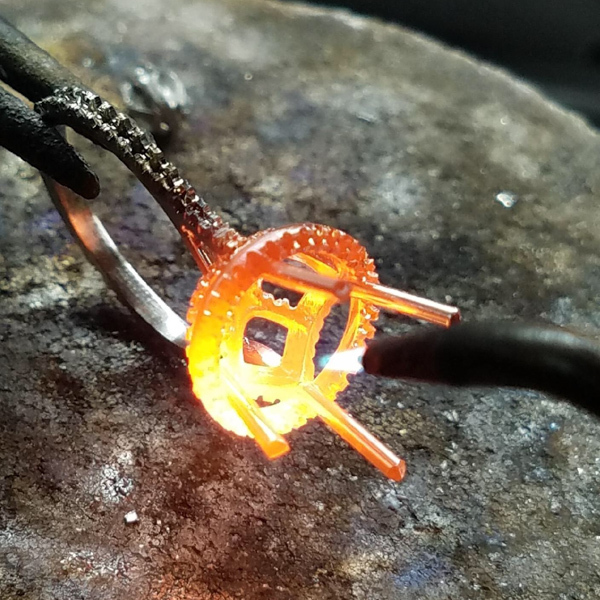 We then begin the process of casting the ring. This process, called the lost wax casting, involves covering the resin model in plaster to create an impression of the design. The plaster is then heated with a special induction machine from Italy to release the resin from the mold. The resin model from the photo above may be ‘lost,’ but we now have a perfect plaster impression to pour our precious metal into. Green Lake casts jewelry with 100% recycled metal grain. Out of casting this platinum ring took shape with a diamond layout for added precision and ample material for final setting. 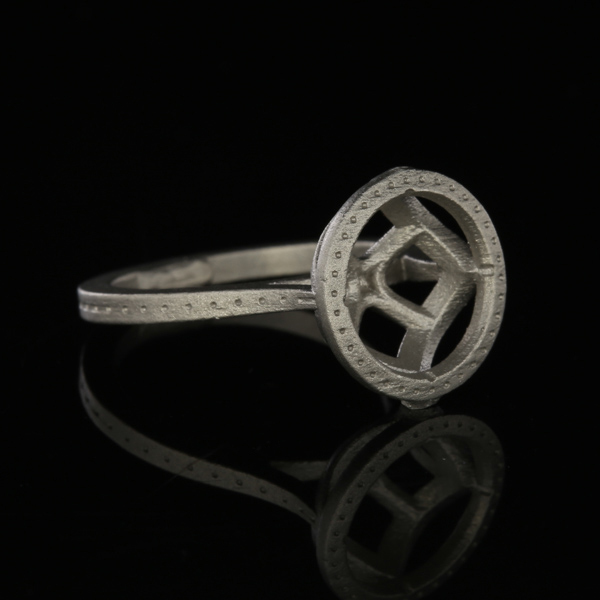 The cast ring is now ready to be handed to a jeweler to craft every detail by hand. 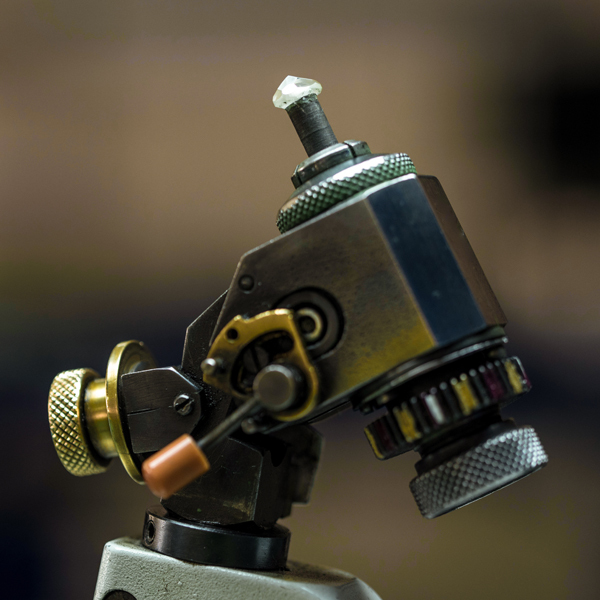 At Green Lake, all areas of old-world jewelry making are completed in a single workshop. 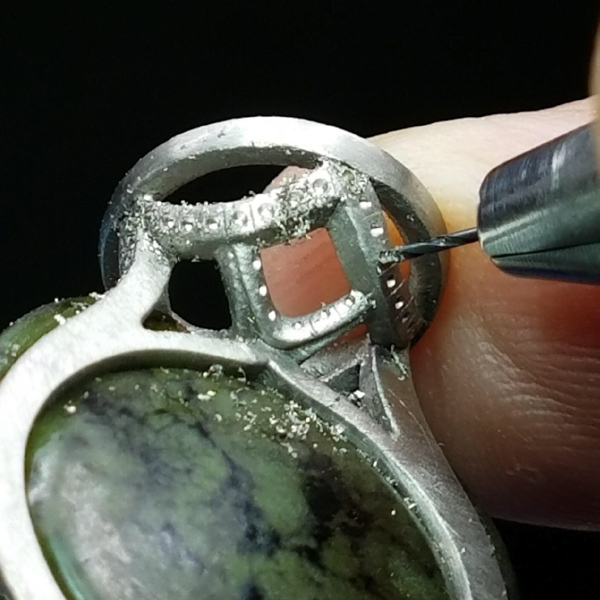 Our designers and jewelers work in close proximity with frequent collaboration to ensure every detail is perfect. It’s the nuances and care of each piece that make them so unique and one-of-a-kind. Master jeweler Henry will be crafting this ring. He cuts away more material to create this signature setting. 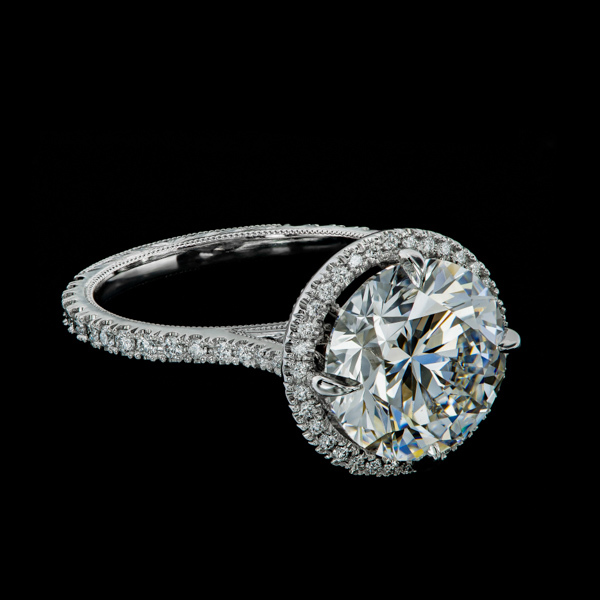 Creating a fine split between the diamonds creates the look of the fishtail style. 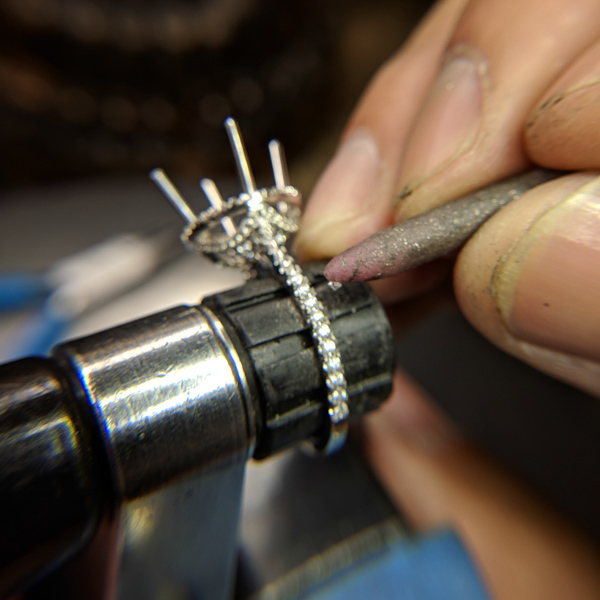 Prongs are fabricated by hand for a clean finish around the center diamond. 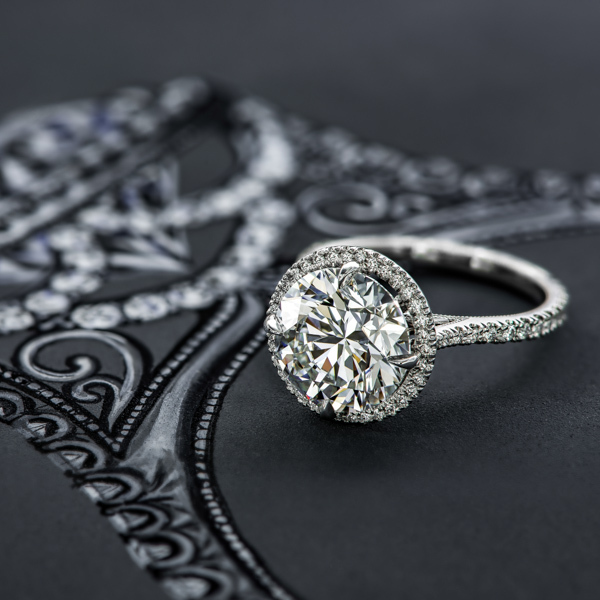 Delicate filigree curls are crafted by hand to fit perfectly in the open undergallery of the ring. Time to set the smallest diamonds! Wow! Perfectly mirrored curls make this design incredibly detailed. Now, Henry is ready to set the center diamond. 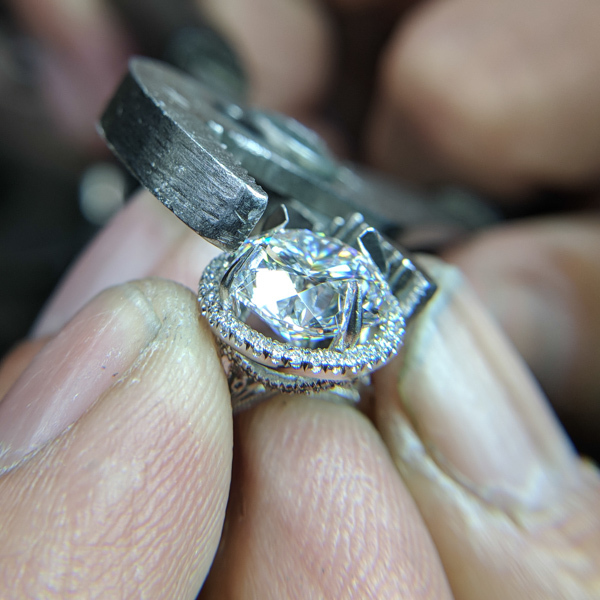 Pushing the prongs down for a snug fit. 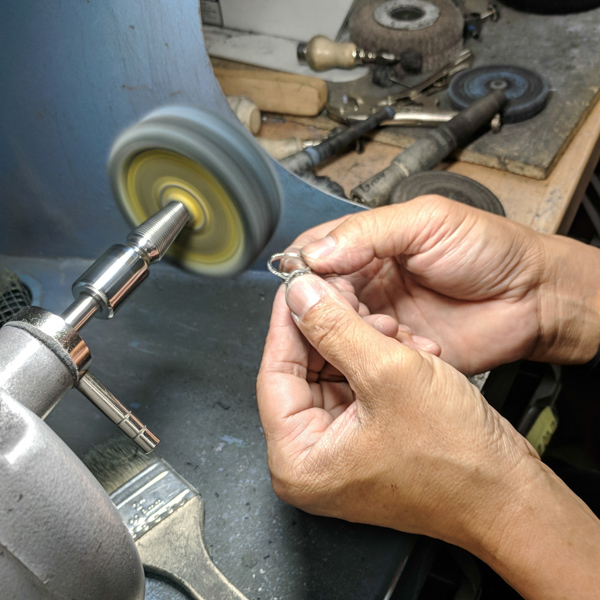 The care and attention to detail on behalf of the designer and jeweler is immediately apparent when you see the finished ring. 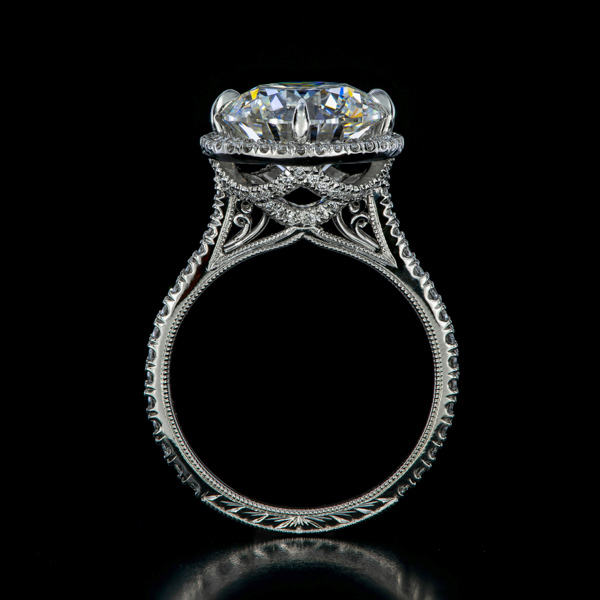 We hope you enjoyed seeing the story of this engagement ring design and fabrication. 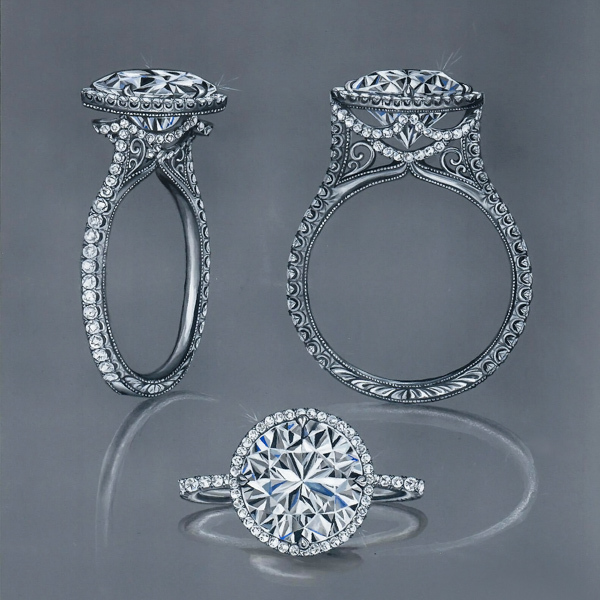 Let us know how we can custom design the perfect ring just for you. ©2005-2016 Green Lake Jewelry Works. All rights reserved.